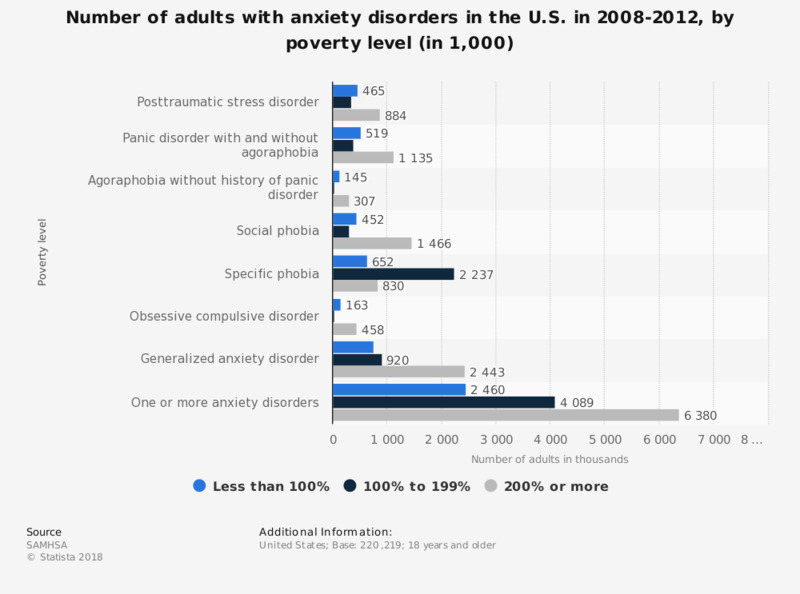 This statistic displays the number of adults with an anxiety disorder in the United States in the period 2008-2012, by poverty level. Some 920,000 individuals with a family income between 100 and 199 percent of the poverty threshhold had a generalized anxiety disorder within a past year. Total family income is less than 100 percent of the U.S. Census Bureau poverty threshold (i.e., total family income is below poverty threshold). Total family income is between 100 and 199 percent of the U.S. Census Bureau poverty threshold (i.e., total family income is at or above the poverty threshold but is less than twice the poverty threshold). Total family income is 200 percent or more of the U.S. Census Bureau poverty threshold (i.e., total family income is twice the poverty threshold or greater).